Although sightings of the creature on land surrounding the loch are said to date back to the sixteenth century , modern interest in the monster was sparked by a sighting on 22 July 1933, when Mr George Spicer and his wife saw 'a most extraordinary form of animal' cross the road in front of their car. 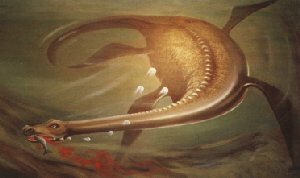 They described the creature as having a large body (about 4 feet high and 25 feet long), and long, narrow neck, slightly thicker than an elephant's trunk and as long as the width of the road (about10-12 feet wide); the neck had a number of undulations in it. They saw no limbs because of a dip in the road obscuring the animal's lower portion. It lurched across the road towards the loch 20 yards away, leaving only a trail of broken undergrowth in its wake. On 5 January 1934 a motorcyclist called Arthur Grant nearly hit the creature while approaching Abriachan on the northeastern shore. It was 1a.m. but there was bright moonlight. Mr Grant saw the animal's small head attached to a long neck. It saw him and crossed the road back into the loch. grant dismounted and follwed the creature to the loch, but only saw ripples where it had entered. However, it is said that he had admitted that the sighting was a joke for his friend In another 1934 sighting Margaret Munro, a young girl working as a maid, observed the animal for 20 minutes. It was about 6.30 am on 5 June, and she saw it on the shore from a distance of about 200 yards. She said it had skin like an elephant's, a long neck, a small head and two short forelegs, or perhaps flippers. the sighting ended when it re-entered the water. Land sightings continued infrequently until 1963, when a poor-quality film was taken at a distance of several miles.